What is a Rhode Island Last Will and Testament? Rhode Island Last Will and Testament: What Is It? 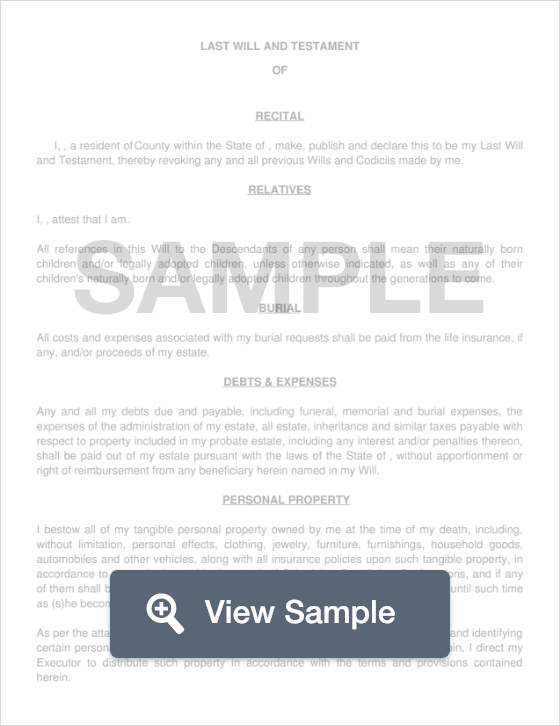 A Last Will and Testament in the state of Rhode Island is a document that not only clearly lays out how a Testator wants his or her assets, property, and other belongings distributed once they die, but a document that also adheres to Rhode Island Law. According to the law, these documents must be signed by two separate Witnesses who are both presents when the Testator signs the Will. Testator - The Testator is the person whose assets will be distributed. This is often the person drafting the Will. Although some Testators may have an attorney draft their Will for them, they must still sign it and have two Witnesses attest that they are of sound mind when signing the document. Beneficiary - A beneficiary is a person who will be receiving assets or an inheritance from the Testator. Generally, Beneficiaries are children or spouses, but a Beneficiary can be anyone who the Testator names in the Will. Witness - A Witness is a person who signs the Will attesting that the document is not a forgery and that the Testator is of sound mind and judgment when signing this document. Each state has its own set of laws, definitions, and signing requirements that relate to last will and testament documents. Below, these specifics are defined for the state of Rhode Island. Witnesses - According to Probate Code Section 6110, the Will must be signed by two (2) witnesses who are both present when the Testator signs.